Looking for Fabric? Visit Portland, Oregon! Tacoma Sewing & Design School held their annual fabric shopping trip to Portland, Oregon this week. 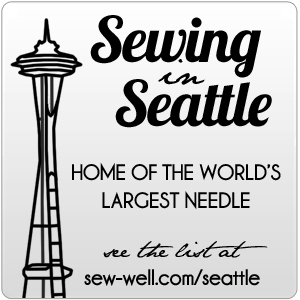 For less than the cost of a train ticket or the tank+ of gasoline and without any of the stress or exhaustion of driving yourself, a large group of us sewing enthusiasts traveled to Portland via tour bus. We left at 7AM and returned by 7PM. The schedule was easy, time was plentiful, bathrooms always available, and of course, the fabric was divine! I'm giddy!! Because of this trip I discovered an awesome source of outdoor fabrics. Imagine going to the kind of store that supplies fabric for TV shows and REI?! Hello awesome! Chehalis for Billie's Designer Fabrics (yes the one from Sew Expo) and Sisters Quilting Shop. Each place held it's own charm and PO (that's short for potential as my friend Kathy says). Many store owners, like the lovely lady at Rose City Textiles, were so happy to see us they put out cookies and juice. So nice! Let me profess my love for Billie's. The fabrics in this store are utterly wonderful. I have never been to the store, only purchased from them at Sew Expo. They are kind, helpful, and they have really interesting sewn up samples in the store. At first I thought I'd buy this yummy herringbone pink flannel you see to the left and make some PJ pants or evena shirt. But then, I stumbled upon a sample of Kwik Sew's K3988, a yoga pant pattern that I own made of this fantastic poly lycra (read wicking). I have been studying active wear so I can make myself some really fun yoga outfits. Why? Because I want it to fit and I haven't found clothing shops nor patterns that either fit, carry something in a plus size or have what I want. And there we have the reason I started sewing in the first place - to have clothing that fits me, looks fab, and is in materials & styles that I absolutely love. Have already made a pair of yoga pants from a cotton T-shirt knit, but have been looking for something a bit sturdier for winter. This poly-lycra is Purrrrfect. And, it's a soft aqua/sky blue. Then, next to it, I found an Italian made, ultra fine, microfleece. Both were within my budget and less than $15/yd. How amazing is that? Truth be told, the fleece became my pillow for a nap on the return trip home. Double Win! I stopped into Sisters and found some amazing fabrics. However, the owner was in a victim state of mind that she angrily expressed to me which turned me off from spending any money in her store. That was rather sad, because she has beautiful taste and amazing fabrics. Having been in exactly her position myself with my own business, I can appreciate her point of view, but I now understand better than ever that each person is important, even if no money is spent and everyone has a circle of influence where they can help or hinder you based on their experience. I hope she finds a happiness soon. Talk about amazing. I'm in love with Rose City Textiles. LOVE. L-O-V-E. This is the REI of the fabric world. Every kind of outdoor fabric you could imagine. I found wicking, I found windblock, I found microfiber, and on, and on, and on! Plus the owner here is the one who put out cookies, called everyone sweetie and genuinely was grateful for each and every customer who came in. I did not spend more than $15 on my visit, BUT I have now been able to see what my options are for outdoor fabrics. I was going to buy some windblock with fleece on the inside, but I haven't decided which coat. I decided long before this trip that my new way of fabric buying must be focused around a project. No clear project, no purchase. I have a freakin wall of fabric that needs use. I must use that and only buy to a project. And I was able to stick to my plan and support my goals. That does not mean I won't be buying here. In fact, that means I will be back to buy only the right things and then will make and wear them, then share here with you. Yes, more sharing because of this new method which benefits RCT and you my darlings! My main goal was to find wicking fabric to make up some more sports bras. The lovely ladies at RCT ointed me to their best & sturdiest wicking fabrics and I bought a yard so I can make a couple. Clicking on the images above and below, you will see several lovely fabrics you can purchase at RCT. Kayso, as I was getting my yard of red wicking fabric, I started reading the sign on the door you see above in the upper left corner. Do you know what that is!!!??? It's a Co-op, called the Portland Apparel Development Center, where you can have someone design clothing for you, take a class and learn to use their commercial machines... T-shirt printer, pattern drafter, sewing machines, HUGE cutting table... and then even rent their equipment. So, you could actually make yourself a coat there or if you wanted to start a business, or make several items in smaller batches, oh my the list goes ON and ON! I'm already working through my WIP/UFO basket so I can clear up the unfinished stuff and start planning new projects (finishing my work in progress is a fall goal of mine - finish it or get rid of it). And the coolest discovery of all?! They supplied fabric for the show Grimm (WOOT! check out those 2 thank you cards I photographed on their store board above) and for Iron Man 3. OMGEEEEEEEEEEEEEEEEEEEEEEEEEEEE! Supporting Oregon film. You know what that says to me? The opportunities for me to join the voiceacting and TV/Movie world are closer and more possible than I've ever known. Solutions and opportunities are everywhere if I keep my eyes peeled! The other super awesome thing that happened at RCT is my friend Rae, who lives in Portland and whom I met during Kenneth King's Moulage class in September at Tacoma Sewing & Design, met up with us. So, not only did I have the huge joy of fabric shopping with the fashionistas on the bus, but I also got to catch up with Rae, see her delightful purchases, and receive wonderful, helpful feedback on what color choices would best suit me. She is such a sweetheart. After the giddy rush of Rose City, we made our way over to Mill End Fabrics. Holy wow. This is bigger than Haberman's (a feat I didn't think possible), which is an awesome fabric store just north of Detroit, but Mill End carries as many quality, high-end fabrics as Haberman's. There is a special place in my heart for Haberman's, so comparing the 2 means I hold Mill End in high regard. I wandered and wandered. I dreamed and poured over the wools and silks. I adored the flourescent colors and the muted ones alike. I admired the pre-pleated rolls of fabric. I let myself get lost a little in a world of PO. I even found my favorite color pink in a soft, sheer cotton. Then, I got serious. Why was I there? To buy fabrics for making work-out clothing and yoga gear. So, I put the sheer cotton back (sniff, sniff) and found the most amazing tone on tone aqua blue spandex/swimwear fabric and also thanks to Rae and Ryliss, settled on a hot pink, and I mean HOT, with white polka dot swim wear to expand my yoga wear and also to compliment the red. I do love me some bright colors. If you thought Mill End looked big, then Fabric Depot makes Mill End look small. It is the giganticness of a Home Depot. HUGE! Many, many quilting, fashion, bridal, home dec fabrics. Quilting patterns, tools, pillows, foam, you name it, you can probably find it here. I have been to the FD previously and got lost in the 1800's retro patterns in their bridal section. One can have tons of fun. And, they were having a Columbus Day sale there - so 30% off. I loved many fabrics there, including the plaid I show in the middle below. But, being nearly at the end of my spending budget for the day (which I stuck to quite well I might add) I decided against fabric and for a tool that would offer me many, many uses. I bought Jaybird Quilts Sidekick Tool mainly so I could cut out isosceles triangles, but also so I could play and cut out other shapes, including the 1" size for itsy bitsy projects. 3 days after returning from the trip I've already used it for 1 project which I'll be blogging about quite soon. WIN! Thank you Fabric Depot for carrying it and Jaybird Quilts for creating it. Everyone on the trip was lovely. I met some wonderful people - a sewing teacher and winner of a wool sewing challenge, a bee keeper who's won 2nd place at the state fair for her honey, and another woman who knits socks for charity. Ryliss had plenty of water, cookies and other items so we were always fed and happy. The bus driver was kind, helped each person off the bus and we had a smooth ride with a functional bathroom. All in all, it was a lovely, lovely day. I am SO looking forward to next year and would really love it if you'd join me. Who knows, maybe we could come up with some amazing new idea or become fast friends.